Moscow’s gentrification projects make it look more like London, but Hampstead and Knightsbridge are still the preferred choice for wealthy Russians, says Aliya Sayakhova. Want to know all about “hipster Stalinism” whatever that means? Read this week’s Guardian’s feature about art clusters in Moscow. From recently renovated Gorky Park and gradually transforming VDNKh, to a planned creative paradise ArtKvartal, old Soviet haunts are becoming hipster hangouts in Moscow. The newly refurbished Gorky Park transformed by its "fairy godmother" Roman Abramovich with glossy contemporary art centre Garage, cafes, bars, ice skating and ping pong, is the current symbol of new and progressive Moscow. Neglected for years, it has now become the most popular recreation place in the capital attracting the young and trendy, as well as not so trendy Muscovites. VDNKh's story is not dissimilar: a decaying monument to Soviet economic achievement, it is now being turned into a key example of "hipster Stalinism." The kebab stands and illegal traders have gone, swapped for coffee shops, gardens and cycle paths. An aquarium that might do Stalin proud, said to be the largest of its kind in Europe, will open soon. The newest example of hipster gentrification in Moscow, ArtKvartal, plans to combine artist studios, pedestrian lanes and cycle paths, with luxury apartments not far from the decidedly down market area around Baumanskaya metro station. The project is still at the design stage and is expected to take between 10 and 15 years to realise, the Guardian said. Given the precipitous decline in the rouble in the past few days, the prospects for any new developments now are far from clear. At a time when the city is hungry for cash, its appetite for art and fashion may fade. Pricey projects like ArtKvartal could be shelved indefinitely. Pessimism aside, Russians remain optimists in the property game. They are the top buyers of the biggest London properties, those measuring over 20,000 sq feet. The Financial Times provides an exhaustive account of the market for big homes, which primarily exists thanks to the buying power of those from the former Soviet bloc and oil rich Arabs. The “excuse” for buying extravagantly large houses in London is the surfeit of small flats back home, says Elena Yurgeneva, head of residential at the Moscow office of real estate agents Knight Frank. 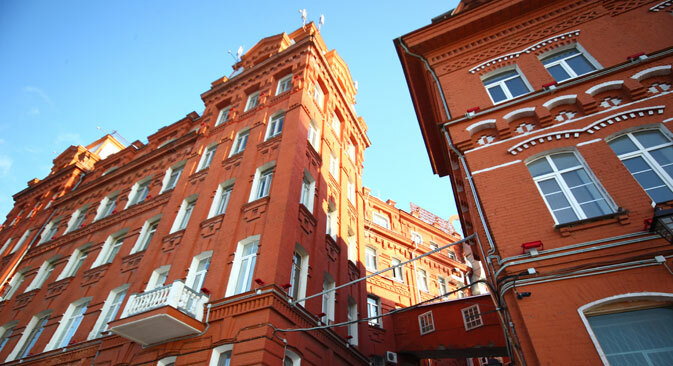 “There are big houses in some suburbs, notably Serebryany Bor, in the northwest of Moscow, but few exceed 20,000 sq ft. Buyers seeking really huge homes must head to the Rublyovskoye highway”. The largest private house in Paris belongs to a Russian too, or to be precise, a Russian citizen, though French by birth. “Proud to be Russian” Gérard Depardieu owns a 20,000 sq ft mansion reportedly put up for sale in 2012 for €50m (£40m) when the Russophile actor quit France in protest at its high tax regime. Subsequently it was taken off the market. Perhaps, Depardieu’s new friends in Russia persuaded the actor to hold on to the house: in the end, Russians are zealous believers in the property market, to such an extent that they have bought one in five of London’s £10 million-plus properties in the past six months, Knight Frank says. Talking of pricey purchases, last week Russia’s richest (and the UK’s second-richest) man Alisher Usmanov bought molecular biologist James Watson’s Nobel Prize medal for £2.6m, intending to return it to the man who helped unravel the secrets of DNA. In a magnanimous move, Mr Usmanov, who owns a third share of London's Arsenal football club, acquired the medal at Christie’s New York after hearing the scientist was selling it. The Uzbek-born billionaire wanted to thank Mr Watson for DNA sequencing that helped promote research into cancer, the disease which killed the tycoon’s father. “James Watson is one of the greatest biologists in the history of mankind and his award for the discovery of DNA structure must belong to him”, said Mr Usmanov. It was not the first time the wealthy businessman and philanthropist has used his financial clout in this way. In 2007 he bought Mstislav Rostropovich’s entire art collection the day before it was due to be broken up and sold at Sotheby’s, paying over £36 million, well above the pre-sale estimate of £20 million, Mr Usmanov presented the whole collection assembled by the acclaimed cellist and his wife, Galina Vishnevskaya, during their lifetimes, to the Russian government. It is now housed at the Konstantinovsky Palace near Saint Petersburg, once a Tsarist property, now one of President Vladimir Putin's residences. The collection is open to public, though getting tickets is not always easy: planning to travel to the city next week, I was disappointed to learn that the Rostropovich masterpieces are not to be seen until January next year. The opinion of the writer may not necessarily reflect the position of RBTH.